So we got some nice rain again today. This is so weird for August, usually we are hot and dry and wishing for rain. It's supposed to be cooler for a few days now too so that's very nice as well. My image today is of the most perfect Sunflower I have ever grown. Usually some petals will open a little wacky or a part of it will be bug eaten but this one opened so beautifully. 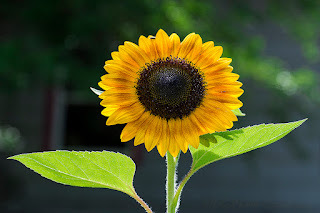 It was lovely to watch it open and I was glad to have planted some Sunflowers since there is no field around here. I can still enjoy them in my yard.